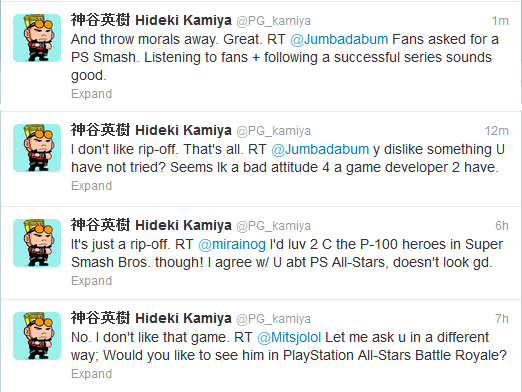 Hideki Kamiya is a video game developer who has worked on some stellar titles over the years including Bayonetta, Devil May Cry, Resident Evil 1 and 2 and Okami to name just a few but he’s hitting the news for an entirely different reason today as he decided to let the world know what he thought about PlayStation All-Stars Battle Royale over twitter. Now I can’t disagree with most of what he has to say as the idea that Sony have just flat out copied Nintendo’s Super Smash Bros is annoying and it beggars belief that they aren’t being sued for it by Nintendo. And after those few tweets his twitter timeline exploded with people randomly throwing insults and compliments his way and him responding in possibly the most arrogant way imaginable. So do you think he’s right and PlayStation All-Stars is just a direct clone? Does he have a right to call it that after working on Bayonetta which has also been called a clone of God of War?